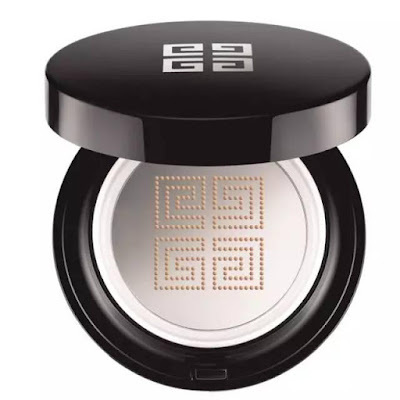 Givenchy Teint Couture Cushion Portable Fluid Foundation - $62 - in 5 shades: 2 Fresh Shell, 3 Fresh Sand, 4 Fresh Beige, 5 Fresh Honey, 6 Fresh Gold - a fluid foundation that offers skincare benefits with buildable medium coverage and a natural-looking, radiant finish. The multi-benefit formula combines long-wearing pigments, active skincare ingredients, a perfecting blur effect and contains a high concentration of water, giving it a fluid texture that plumps, corrects, and unifies the skin, offers ideal glide and leaves the skin with an immediate sensation of freshness with a lightweight result. And you don't have to worry about over-dispensing the product, with just one push, the signature logo delivers the right amount of foundation while the metal plaque protects the formula from the air for fresh skin and a glowing finish. It comes with a sponge applicator which is handy for applying on the go, I prefer to apply it with a brush though, I find it gives it a lighter finish.